Is it all men generally or my husband specifically who can’t detect a hint even when rammed in the face and who will fail epically when it comes to present buying? Who will only manage to buy a gift that is actually desired if somebody else has gone into the shop, chosen and purchased said gift, preferably had it gift-wrapped in store and all they need to do it reimburse a sum of money (and still grumble about the cost). If it’s all men generally, what’s wrong with them? If it’s just my husband whose incompetent, why me? Yesterday was my birthday and the run up to the day was not going well for Husband. And not one of them occurred to Husband. But then there was one gift that I really really wanted: a Pandora bracelet. Just a simple bracelet with a single charm to which family could add to over time (yet another fall-back present option) and I would end up with a truly personal piece of jewellery. My problem is that I don’t like directly asking for a particular present. I have this romantic idea that after 16 years together Husband will have some idea about my tastes and preferences. That when he grumbles ‘So, what do you want for birthday then?’ Actually he’ll be able to read my mind, or at least pick up on the hints I give him following my ‘Oh, I don’t know, I haven’t really thought about it,’ response. ‘There must be something you need,’ he later said, literally tearing up a Move It mail shot as he spoke. So I hatched a plan for Boo to show Husband what I wanted. After all, who could turn down a doe-eyed 6-year-old, especially when they’re offering marital salvation. They had a window between ballet class and a kids’ party on Saturday to go and find me my present. So on Friday I took her into town to have a look at the beautiful jewellery and pick our favourite charms. We discussed how silly Daddy was not to know what to buy but how she could help him out. We even told Husband about our beautiful discoveries. obviously he didn’t take in a word. ‘So, where did you go in town?’ I asked Boo as we walked to the party. I knew she wouldn’t be gullible enough to tell me what she’d bought. What I didn’t expect though was the present I got in its place. 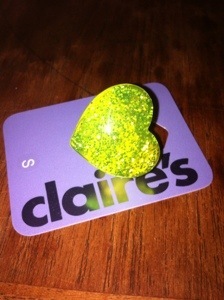 A green, glittery plastic heart-shaped ring. It was up there with the time the twins gave me a pair of silver stacked trainers so I could be like a Spice Girl. And Husband had also used Boo’s cute-factor as she proudly handed over the gift. She was thrilled with it. And I probably would have done if I was 6. Husband must definitely have been thrilled at his less-than-a-fiver purchase. Not being a Tiger Mum I fixed an excited grin and have worn the ring for two days now, my friends awe-struck by its ‘specialness’. My next birthday is a big one. My last big birthday caused such a present-buying crisis in Husband that I didn’t get a present at all. But I have a plan for next year: I’m giving my gift list to my best friend and giving her telephone number to Husband. It may not be romantic, but it’s also not going to be a green plastic ring. When did it get so complicated? Surely babies and small children have needed transporting from place to place for time immemorial? So why have they not yet found the ONE ultimate way of getting them from A to B that’s easy and comfortable, that keeps the tot safe and cosy and doesn’t exert undue pressure on the parent or their bank balance. Why all the widgets and digits that offer the world, but don’t quite fit the bill? (Not only can you plug in an MP3 with some, but I’ve seen one with a pre-installed DVD player should the environment around him/her by be stimulating enough. But then you have to buy essential things like a rain cover or footmuff as extras.) I spent the morning looking at buggy design after buggy design and my head was swimming. By the time I clicked the Purchase button my stomach felt sick at the money I’d just spent. Does it really have to be so hard? And so expensive? I suppose the benefit of having a gestation period of 9 months is that parents can plan and save and there isn’t a last-minute scramble to get everything in place. The trouble with having a daughter only admit to a pregnancy 7 months in is that it doesn’t really give much time to plan. Early on (well, early being relative, at least soon after her bump admission) I made a rash promise that she could have Noodles’ buggy. It made sense at the time. His had come as a travel system, so not only is it a toddler buggy, but also has many of those widgets that they make sound so necessary, but then barely see the light of day. Carry cot, car seat attachment, buggy board (and yet a hood that curiously doesn’t cover the child when sitting up, although luckily a rain cover was included and fairly useful, although I’ve yet to meet a toddler who doesn’t mind being encased in a plastic shield – obviously they don’t realise how lucky they are when, you, as parent, has had to relinquish the possibility of using an umbrella and so are exposed to all elements). Most now lay around the house only having been used temporarily so still in decent condition. It seemed silly to have them around without being used and buying a whole new kit. So E could have the current buggy and I’d buy a new, more basic version for Noodles. Or, I thought, with a baby sling and the buggy board and Noodles happy to walk on his reins we could share. But after a few walks out buggy-free with Noodles I realised this wasn’t going to be an option. Everything takes forever and he does like to let his legs give way so that he has to be plucked into the air by his backpack straps before he hits the deck face first. He finds it hysterical. I find my wrist aches 10 minutes down the road. That and his ability to scream a shop down if he can’t lead the way round, which is, somehow intuitively always counter to the aisles you actually need to visit. Nothing like death stares from fellow shoppers to know that restraint and wheels are the preferable option. Not to mention that re-configuring the buggy from pram to pushchair and back again is an almighty faff that usually results in the loss of flesh due to the various mechanisms involved. Not something I fancy facing on a daily basis. I was going to need another buggy. How hard could it be? Not a pram or travel system – I was on a roll, I could eliminate quickly and painlessly. This was going to be easy. Seeing as every time I’m in a queue in Mothercare I seem to be behind someone trying to get a refund on a shoddy stroller I discounted them too. What’s the difference between a buggy and a pushchair for a start? And did I want a single or a double? I shall be looking after the baby a fair bit, but will I need to take it out with me enough to need a double? Could I possibly just stay in the house and shop online until E finishes her exams at which point the baby, Noodles and I could emerge blinking, unaccustomed to sunlight? After all, it’s surely going to take an eternity to get a baby and a toddler simultaneously ready to go outside. Staying indoors would definitely be the easier answer. But there’s the school run to do, baby gym to get to. The only stores in town that stock a decent range of baby products are actually out of town, but a trip that’s easier to do by walking than it is to drive and then get Noodles out of the car, into a trolley, out of the trolley, back into the car and then not find a space to park near the house, so finally a walk juggling shopping with toddler. Add a baby into the juggling act? Yep, I’m going to need wheels for them both. But do I want the burden of a cumbersome double buggy if it’s mostly just Noodles? I couldn’t wait to bin the twins’ double buggy, its stretch limo design of one in front of the other making it impossible to manoeuvre around corners with 3-point turns required frequently in shops. Looking, the budget end offered very similar contraptions. I couldn’t do that again. Side-by-side could be cute, with Noodles babbling away to his nephew. But pushing one around with just Noodles in it would be weird, wouldn’t it? But the biggest sticking point was that a side-by-side buggy wouldn’t get through our gate or front door. The logistics of having to seperately unload two children on the pavement then collapse the buggy to get it inside. It would end in me one side of the door and two children the other, wouldn’t it, either through a random gust of wind or a mischievous pair of toddler hands? But I had a friend who had raved about her Phil and Ted’s buggy – one of those where it looks as though one of the children is riding in the shopping basket. I’d not really seen the appeal in them before – hardly the most amazing view for the child sat in the back. But it converts easily from a single to a double and back again and is far less cumbersome than the double alternatives. But the prices! Phew! Ok, reasonable compared with the £1600 Stokke (my CAR only cost a fraction more!) but still not far removed from a monthly mortgage payment. I couldn’t justify it, could I? I looked for similar makes, for earlier models, for discounts. Which is when my head truly started to spin. How can the same thing come in so many permutations, at so many prices? Can I trust eBay? It would be my luck to get the dodgy seller. Or the ones I liked the look of needed picking up from the other side of the country. Would I then be easily able to get any attachments easily if I got an earlier model? Or will the manufacturers cunningly adjust things ever so slightly so the the old will be obsolete whilst New doesn’t quite fit? I’m losing the will to live, trawling through option after option and decide to buy new from a trusted website. I entered by details and hit the tab and my stomach lurched. I’d found a decent deal, but it was still over budget. Husband can’t possibly find out how much I’ve paid (same as I did with my wedding dress, same as I do with just about anything I buy). Hopefully he won’t notice we’re eating a lot of beans on toast over the next month. But at least it’s done. It arrives on Monday. May I never have to do it again. Aren’t pregnant women meant to have the nesting instinct? It turns out that E’s instinct is more to hibernate. I don’t blame her – I’d rather like to curl up under my duvet all day too. It’s dark and it’s cold and it’s wet out and the house has way too many drafts to encourage getting up. I suppose she may as well lie-in whilst she’s got the chance. But meanwhile the rest of us are doing the nesting for her. Up until this week she’s had a typical teenager bedroom. The room that defies the laws if physics, since things go up but never come down. Although the remains left in bowls seem to have tried to develop the ability to escape from The Pit themselves. She’s maintained it’s all her twin sister’s fault since they’ve shared a bedroom. S’s side of the room has definitely suffered the most with dubious carpet stains. And yet her room at university is immaculate. (Well, except for a large blue mark on the wall, but that was caused by me crashing into the wall knee first in dark blue jeans whilst playing Spin on her chair.) A definite disconnect – maybe E has been sabotaging S’s side of the room, or maybe S has had an epiphany of personal accountability now that she has a room of her own. Yet it’s still the blame game when it comes to the stain. Thankfully E’s boyfriend has realised that it’s preferable to have a room in which you can put the baby down without fear of losing it under a pile of clothes and that discarded nail varnish bottles probably don’t make the best play things. So the room has been scrubbed into submission. Instead of mugs and bowls, polish and rubber gloves have disappeared upstairs. I’ve been questioned on every aspect of stain removal. And the vacuum has worked harder than it has before. Attachments have even been used! We’ve got side plates and glasses in the kitchen cupboard again, the bowls with dubious content are soaking (although possibly should be sent to a lab for testing) and I’ve even got my hairdryer back (which the twins vowed they didn’t have). Whilst all this has been going on, E has sat on her bed moaning. Such is the hormone-adled prerogative of the pregnant woman, I suppose. But kudos to her boyfriend for biting his lip and carrying on. Meanwhile I’ve had the pleasure of ironing tiny items of baby clothes that I’ve requisitioned from friends to whom I passed on Noodles’ baby things. Ironing is really not so arduous when the clothes are so very small. Too too cute. And so this baby isn’t entirely and hand-me-down baby I’ve been to the shops for even smaller newborn sleepsuits and vests, dinky mittens and hats. The sort of thing that makes your uterus skip a beat. So the room is ready, the hospital bag packed, the crib is in place and unless 3 people have beaten me to it, a double buggy should be in our possession by Monday. The next bit is all down to E though. We can be by her side, but nobody can squeeze the baby out for her. Maybe that’s why she’s staying put under her duvet! It’s my birthday next week. My 39th birthday to be exact. How that happened I’m not so sure – I’m sure I was only 27 last time I looked. But you can’t argue with the maths – I’ve definitely only got one year left of my thirties. I’ve promised myself that I shan’t spend the next 12 months rounding everything up like I did when I was ‘nearly 30.’ Instead I shall remain firmly in my 30s until someone hands me a massive/very expensive present and a cake with 40 on it. But I shall also be holding my breath waiting for the seismic shift whereby my entire world falls into place. After all, it’s what the magazines have been promising me for more than a decade: that at some point in my 30s I’ll find the perfect hairstyle, I won’t mind my slightly more curvy figure (because it will be toned and gym-honed), I’ll have a husband and kids who adore me, a house full of tasteful buys funded by income from a swish job and still time to go out for cocktails with my girlfriends. It will be hectic (some nights I won’t get a full eight hours of sleep, but a facial will sort that out). But it will be fulfilling and I’ll be having the time of my life. Except it hasn’t happened yet. It started promisingly enough. At 30 I’d just got married, I had started a degree, I still had time for the gym and friends and date nights as the twins were old enough to be easily babysat. And then I had more children. The degree? I have a certificate and a student debt. But shiny careers that allow for family demands are few and far between. And I’d rather spend time with my children than paying someone else to have the pleasure. The marriage is still standing, but it’s funny how Hubby has the ability to do as he pleases whilst I’m luckily if I can have a shower without someone small demanding my attention. I can’t get through a home workout without the smallest trying to play horsey and jogging is trial enough without dragging a 6-year-old along too. And unfortunately everything didn’t ping back as well as it did in my 20s. I can’t afford a haircut, let alone THE haircut that will change my life. And my friends are still wonderful and witty and absolute angels, but getting through a conversation without every sentence being interrupted by a whirling dervish of a toddler never happens. Which makes me sound so ungrateful, but really I’m not. My children light up my life every day. They exhaust me, cause endless guilt and fear and worry, and they make the house look as though a branch of Toys R Us has been dropped on it at some force. But they make me laugh every day. They amaze me. And nothing feels better than their physical presence, their silky soft skin and embracing arms. And I know that the early years are precious and fleeting and there will be a time when they’re gone to be all independent and although I shall have more time for my friends and my husband, a career and hobbies, I shall miss the chaos of a house with small children in it. It’s just that it’s not the line I read about time and again. Maybe there are women out there who do have it all. Women who juggle the career with the kids and still have time for glittering parties and manage to mutter more than a couple of cursory instructions to their partners. I tip my hat to them and wonder how they fit it all in. I can only imagine someone’s invented the 36-hour day, but the email is sat unread in my inbox. Or maybe all this time I’ve simply misconstrued what it means to ‘Have It All.’ In my world I’ve come to realise it means having spots AND wrinkles, head lice AND grey hair, having to be at work AND at the school play. Although I’m not really sure that that’s what the glossy magazines were suggesting. Besides which, it all seems like such a lot of effort and I’m essentially lazy. And as Tiana’s dad says in The Princess and the Frog, ‘wishing on a star will only get you so far. You have to work to get all the way there.’ I’d rather have an extra hour of sleep than be up to blow dry my hair. I might loathe my flabby tummy, but Noodles enjoys bouncing up and down on it. And much as I might envy the celebs for the school-run shininess, but at least I can get away with pulling on yesterday’s jeans without fear of being papped. So what that I don’t have the glossy lifestyle? I have time to spend with my children, to laugh and joke with them, to wipe away the tears, to watch them sleep. That said, if my fairy godmother would like to come and wave her magic wand in my direction over the next 12 months I wouldn’t say no to having a Kate Middleton mane, the stomach I had at 18 and a satisfying-yet-non-consuming job. But if not, never mind. The shiny hair would only get covered in mashed banana anyway. 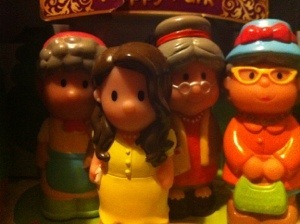 What do you think of when you think of a grandmother? A silver-haired old lady with the touch of crepe paper and the scent of sweet sherry? A woman with a penchance for knitting and baking and casual racism? A collector of knick-knacks and trinkets and the keeper of generations of family secrets? Or maybe they’re just my grandmothers. But in a matter of weeks I’m about to move up a generation and become a grandmother myself. Not something I thought would happen before my 50th birthday, let alone something that would happen before my 40th!!! I do make a mean fairy cake and leaving a weekend away for the sake of a tea dance earned me the nickname Granny Nat, but I very much do NOT feel ready to have a status that brings to mind the ranks of the blue-rinse brigade (even if it has been fun watching friends’ jaws hit the floor when I’ve told them the news). Obviously the biggest seismic shift is going to be for my daughter, E, who despite her ever-expanding belly still seems to be in denial about her impending motherhood. She will have to go from a teenager concerned about A level deadlines and which nail varnish to wear to all the angst and fear and worry and guilt and all-consuming love that comes with being a mum. And those A level deadlines will still hand over her despite the sleepless nights and days that feel as though you’re living a life encased in a gel of tiredness. She’ll be lucky if she can find the time to paint her nails any more. But, as I’m not of the super-gran generation, those wonderful women who put their children and grandchildren first and who can whip up a 3-tiered birthday cake to Mary Berry standards whilst knitting baby cardigans, those of my grandmothers’ and mother’s generation. I’m also anxious about myself, the impact the baby will have on me and where I now belong. E and her boyfriend are living with us. It’s as though our house operates a one-out, two-in policy as news of the baby arrived just as E’ s twin sister left for university (damn and blast strong teenage abs). A generation ago it did much the same as I moved back home with the twins as babies just as my sister was leaving for uni. Strange how history repeats itself. Until E has completed her A level re-sits in the summer maternity leave will be a luxury unafforded to her and I shall have to care for my grandson whilst she studies. This doesn’t particularly change my life in any fundamental way as I’m currently a stay-at-home mum anyway, with 2-year-old Noodles and 6-year-old Boo my biggest priorities. But looking after one child is phenomenally easier than looking after two, ditto two compared with three, the ratio of arms to children being of rather whopping significance. And with Uncle Noodles being something of a mummy’ s boy (as 2-year-olds should be allowed to be) I’m intimidated at the prospect of my ability to cope. I vividly remember watching a friend struggle to cope with her toddler son and baby daughter and thinking ‘I’m glad I wont have to go through that.’ And yet there I’m going to be, trying to meet the demands of differing age groups (the one bonus of twins was that at least they’d roughly be doing the same thing at the same time). Please please please let it be a placid baby! And please please please let Noodles be willing to share my time and my body. Mind you, I don’t get to exercise or cook or read the papers or go to the loo without him following me or climbing on me or clutching at my legs (I call him my mini shadow) so I don’t suppose it’s a concept that’s going to come naturally to him. Once more, please please please let the baby be placid! And then there’s the responsibility of looking after someone else’s child. It seems ok to make mistakes with your own, to muddle along and hope it all comes out in the wash. But someone else’s? You don’t want them looking at you and thinking ‘But I trusted you.’ Although I’m sure E is thinking the same thing, I don’t think I’m ready! On the plus side, I suppose I won’t have to worry about ageing reactions and arthritic fingers and dropping the baby (a big concern for a neighbour who recently became a gran, although she’s been fine so far). But conversely I’m still going through my own tunnel of tiredness with Noodles still not sleeping through the night. It’s not every grandparent whose suffering from child-raising sleep deprivation. Perhaps I will drop the baby out of exhaustion instead! With B-Day looming large on the horizon it’s easy to worry about how all the pieces will fit, but I suppose once the baby is here everything will slot into place. And I shall be lucky to have access to so much time with my grandson, both in terms of sheer hours with him in the day and (hopefully) in the years before I pop this mortal coil. It’s going to be strange to begin with raising a baby and his aunt and uncle at the same time, to be a mum and a gran in the same breath. To have to explain to strangers that, yes, that one’s my son, but that one’s my grandson. Especially as I bet E will soon have a flatter tummy than me too. Again, damn and blast strong teenage abs. Or to breastfeed Noodles whilst bottle-feeding the baby. To constantly be jumping the generation gap. Or maybe it will be no different to being a mum, just with a different label? I guess it won’t be too long until I find out!